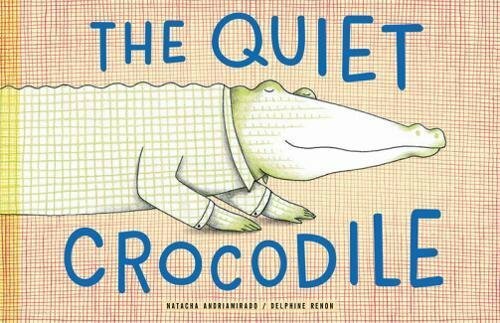 Innovative design combines with traditional story telling in the sweet and simple The Quiet Crocodile. Fossil, the perfectly named crocodile, is quiet. He sits still for long periods of time. He daydreams. He thinks. He likes to be alone. Yet while this solitary croc is napping, thinking, dreaming, he is being joined by his vast variety of friends. Hippo is the first to come along. He marches onto the scene, right up Fossil’s tail onto his back, lays down atop Fossil’s head, dons sunglasses, and bathes listlessly in the sun. Bunny joins the stack and hops up on Hippo’s belly, lounging away. As surely as Fossil loves to be alone, he most certainly is not. Hippo and Bunny are met by Lion and Cow who, in turn, stroll right up onto Fossil’s back taking their places along side Hippo and Bunny on Fossil’s head. Sheep, Dog, Bird, Zebra, Red Bird, Turtle, Chick, Bear, Fish, Blue Bird, Monkey, Cat, Mouse, Hen, Rooster, Pig, Penguin, Duck, Badger, Octopus, and Toad take their strides up and into the bustling crowd of friends gathered on top of Fossil’s back. Judging by Fossil’s sly grin, he clearly adores his friends and the attention they give him just a much as he likes being alone and quiet. There is some depth and unpredictability to Fossil’s personality! The end leaves off with a crocodile wink and the sneaking suspicion that the entire procession is about to start all over again . . . and again . . . and again. One can almost hear the friends pleading and chanting “Do it again, Fossil, do it again!” This whole scenario plays out as keenly as it would with a lively little one who is nagging napping dad to get off the sofa and play. When he finally gives in, a chorus of “Do it agains” is likely to ensue. Little design touches add to the unique presentation. A cast of who’s who of Fossil’s friends flanks the story with each friend assigned a name, a species and a color coordinated dot. The dots in turn, accompany each character at the top of the page on which he enters the story to join the party on top of Fossil’s back. The dot colors are not a unique match to each individual animal, and they are a bit too small and tricky to track as the friends gain in number. They do serve to draw the reader further into the story, encourage interaction with the characters, and demonstrate symbolic representation. It is mesmerizing to count the dots as well as the cluster of intertwined friends on Fossil’s back particularly when they are also displaced after Fossil flicks his tail. Each character is light, fresh, and airy. Their delightful expressions change from scene to scene and there will always be something new to discover with each reading, of which there are likely to be many. This is one fun, lively, and attractive book. Cindy Helms' most recent children's book is Polygonsters. She is an author, illustrator, and visual artist noted for conceiving unique and unusual projects.